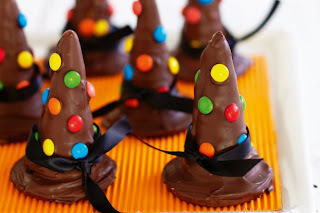 Get into the Halloween spirit with these fright night witch’s hat cookies. 1) Process flour, sugar, cocoa and butter until mixture resembles fine breadcrumbs. Add egg yolk. Process until dough just comes together, adding 2 teaspoons of cold water if necessary. Turn pastry onto a lightly floured surface. Knead until just smooth. Shape into a disc. Cover with plastic wrap. Refrigerate for 30 minutes. 2) Preheat oven to 180°C/160°C fan-forced. Line 2 baking trays with baking paper. Roll out pastry between 2 sheets of baking paper until 5mm thick. Using a 5.5cm cutter, cut 12 rounds from dough. Place rounds, 3cm apart, on prepared trays. Refrigerate for 10 minutes. 3) Bake for 10 to 12 minutes or until light golden. Cool on trays for 5 minutes. Transfer to a wire rack to cool completely. 4) Line a tray with baking paper. Using a small pastry brush, spread a little melted chocolate onto the top of 1 biscuit. Working quickly, dip the outside of 1 cone into chocolate, turning to coat all over. Stick the cone onto the biscuit. Place onto prepared tray. Working quickly, decorate cone with M&Ms. Repeat with remaining biscuits, melted chocolate, ice-cream cones and M&Ms. Refrigerate for 20 minutes or until set. Tie ribbon around base of each hat. Serve. Η σελίδα δείχνει cache εκδοχή (στιγμιότυπο) περιεχομένου συνταγής από το public domain: http://greatcakerecipes.blogspot.com/2012/10/witchs-hat-cookies.html. – Μεταβείτε στην πηγή με το σύνδεσμο: Great Cake Recipes http://greatcakerecipes.blogspot.com/2012/10/witchs-hat-cookies.html.